1. Why sample your soil? Soil testing is essential in order to check the levels of nutrients, pH and other factors that impact your soil's ability to support plants. The most important factor in testing is to carefully remove samples from your soil. A good representative soil sample will help you decide whether you need to take such actions as applying lime or fertilizer. If the sample is not representative of your soil, you run the risk of inaccurate test results, inappropriate recommendations, and yield losses. 2. What do you need to do your own soil sampling? Do not use metal buckets, or plastic buckets previously used to hold fertilizer or lime, to prevent possible contamination of your sample. 3. When do you take soil samples? Sampling can be done anytime. To maximize the benefits of sampling and have enough time to apply fertilizes and lime, we recommend that you do your sampling in the fall. Fields with cultivated crops may be sampled anytime after harvest and before planting. It's best to sample fields with non-cultivated crops during the dormant season. Samples may be taken after planting if you suspect soil conditions such as salt concentration is the cause of poor stand establishment. Take the sample from the area around the roots of the seedlings. 4. Where do you take soil samples? If the soil is uniform across your field, take 15 to 20 samples from random locations throughout the field. 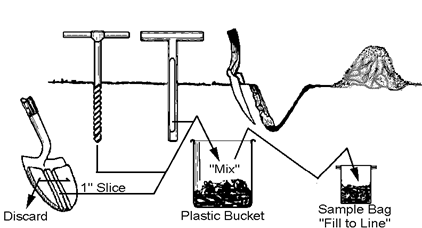 Combine these samples into one sample by mixing them in a plastic bucket. If the soil is highly variable from one part of the field to the other, divide the field into smaller uniform areas and treat each of these areas as a separate field. Take 15 to 20 samples from each area. Combine these as suggested above. Test each combined sample from each area separately. Separate test results will allow you to appropriately remedy the deficiencies of each subdivision within your field. Indicators of variable soil include differences in soil appearance, texture, wetness or salt content. Avoid sampling close to lime or manure piles, animal droppings, freshly fertilized rows, low spots, fences and roads. 5. How deep do you sample? In turf and other shallow rooted crops, sample the top three to six inches of the soil. In ornamentals and other deeper-rooted cultivated crops, sample the tillage layer (the top six inches). In non-cultivated crops, samples should be taken from a depth of six to eight inches. Use a zigzag random approach when taking samples and subdivide non-uniform fields into smaller, more uniform areas. Taking soil samples at random locations throughout your field is important to get a good representative picture of your soil conditions. One way to ensure this is to use a zigzag pattern across the entire area. Random sampling ensures "non-bias" in your soil sample. This results in a sample that is representative of your entire field.